It was the film that was deemed unable to ever be made and even when finally made and released in 1987, The Princess Bride was not a runaway hit at the box office. However, 27 years later the film is embraced as a classic and loved by millions all around the world who have grown up with the film and are now showing it to their families. Rob Reiner's film has only gained in popularity over the years due to its timeless nature, comedic screenplay and universally appreciated story of adventure and romance. However, The Princess Bride can never be spoken of without the mention of one of it's many memorable quotes such as "Hello. My name is Inigo Montoya, you killed my father, prepare to die", "Inconceivable!" and, of course, 'As you wish". Based on William Goldman's beloved classic, The Princess Bride opens with a grandfather (Peter Falk) reading to his sick grandson (Fred Savage) the tale of Buttercup (Robin Wright) and the farm boy she fell in love with, Westley (Cary Elwes). 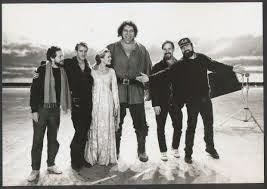 When Westley is captured and never heard from again, Buttercup is chosen by Prince Humperdinck (Chris Sarandon) to be his wife before she herself is kidnapped by Sicilian Vizzini (Wallace Shawn), Spaniard Inigo Montoya (Mandy Patinkin) and giant Fezzik (Andre the Giant). One would expect the Prince to come to Buttercup's rescue, but it is instead the Dread Pirate Roberts who is her saviour. 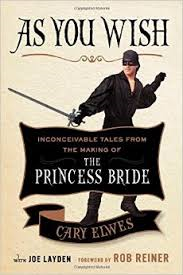 "As You Wish: Inconceivable Tales from the Making of The Princess Bride" is Cary Elwes' gift to all fans of The Princess Bride, and even for those who do not yet know that they are fans of the film. In his memoirs of the film that made him a star, Elwes states that when asked what The Princess Bride means to him and what are his favourite moments of the film, he cannot explain in just a few words. "As You Wish" is his way of helping people understand how much the film means to him by way of his memories and stories from the set, as well as the role it has played in his life and career since. While the book it penned by Elwes, it contains interviews with Rob Reiner, William Goldman and cast members Robin Wright, Mandy Patinkin, Billy Crystal, Chris Sarandon, Wallace Shawn and Christopher Guest. Also included are never before seen photos from on the set from Reiner's personal collection. "As You Wish" is the perfect companion to The Princess Bride. Like the film, the book is an uplifting piece of work which has a great deal of laughs and beautiful memories. It is obvious that Elwes and his cast members look back on their time on set with pride, happiness and love and all this is infectious. The inclusion of the memories from other cast and crew is valuable as the book doesn't feel bias in the slightest, but it also makes the book feel like a team effort like the film was. The detail in which Elwes recalls events on the set is particularly admirable, especially considering it is now nearly thirty years after they have taken place. Yet, this reinforces how much he enjoyed and treasured his time playing Westley. Elwes writes in a conversational style which absolutely makes reading a more personal experience and his enthusiasm and sense of humour adds to the readers enjoyment of the book. Unlike many other "making of" film books, "As You Wish" does bring new information to light. Readers find out how terrified Wallace Shawn was of partaking in the film and struggled with insecurity over his acting ability, as well as how much preparation really went into the epic sword fight between Westley and Inigo.The reader feels like they immediately have to revisit the film with the new information which they are given and try to see if they can spot the people in the Rodents of Unusual Size, recognise Elwes' pain as he works with a broken toe or pick up on signs that Elwes as a "mostly dead" Westley is actually trying his hardest not to laugh as Billy Crystal improvises as Miracle Max. Even for those who didn't quite understand the appeal of the film, they feel encouraged to revisit the film with a new appreciation. Those who haven't seen The Princess Bride will not feel at a loss at not having done so, as Elwes attempts not to discriminate against those who haven't seen the film and explains the film and it's contents with clarity and in detail. "As You Wish: Inconceivable Tales from the Making of The Princess Bride" is an absolute must for any fan of The Princess Bride. If you wish to buy As You Wish: Inconceivable Tales from the Making of The Princess Bride , please follow the below Amazon link.